1 Can be kept and released in a Fish Basket . Untameable on ARK: Survival Evolved Mobile. The Coelacanth (see-luh-kanth) is one of the creatures in ARK: Survival Evolved. Coelacanth nutritia is one of the few creatures on the Island with a relative which can be found back home. The Coelacanth thrive in the waters around the Island, as well as within rivers and lakes. Unlike most Coelacanths, Coelacanth nutritia meat contains less oil and urea. In fact, it is one of the healthier sources of meat I've yet found. Most Coelacanths are opportunistic feeders that eat anything smaller than itself, likely including baby water snakes, insect and plant life, and perhaps each other? While their limited intelligence makes them unsuitable for taming, Coelacanths provide a viable source of meat for coastal or water-dwelling tribes. Many a day has been spent fishing by the water's edge, often with surprising results, as Coelacanths often have consumed discarded garbage that is sometimes of great value. Due to their small size, though, a larger tribe would require a significant number of Coelacanths to feed itself. The Coelacanth will lazily swim around until provoked. At that point, they will swim away from the player. Coelacanths are lobe-finned fish, with rounded heads and eight fins. Unlike their dark blue and black real life counterparts, the coelacanths of ARK come in a variety of colours. This section displays the Coelacanth's natural colors and regions. 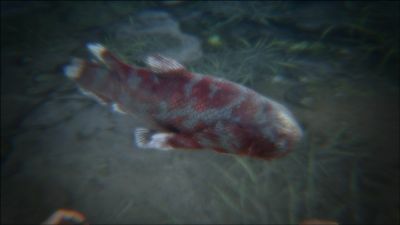 For demonstration, the regions below are colored red over an albino Coelacanth. The colored squares shown underneath each region's description are the colors that the Coelacanth will randomly spawn with to provide an overall range of its natural color scheme. Hover your cursor over a color to display its name and ID. Before Scorched Earth, the Coelacanth was the only creature to naturally spawn with any of the primary and secondary colors: Red, Orange, Yellow, Green, Blue, or Purple. For example, "cheat SetTargetDinoColor 0 6" would color the Coelacanth's "body" magenta. The Coelacanth - Underwater is a variant of the Coelacanth that can be found in the Ocean. It is identical to the normal Coelacanth in all aspects. 5The Coelacanth is incapable of drowning. The Coelacanth bites the target. This section describes how to fight against the Coelacanth. Coelacanth are frail and fairly slow. Hunting them is easy. If you have a Brontosaurus, going near a water source and simply swinging that way once or twice is a good way to farm these, considering the huge range of its attack. Coelacanth are extremely docile and passive, meaning they will not attack the player. Simply going into the water with spear at the ready is strategy enough. When you begin to attack them, they start to swim away, so if you have no level ups in Movement Speed or Oxygen chasing them may be a challenge. However, they still swim slowly enough while fleeing, that they can be caught up to easily. Coelacanth by themselves do not pose a threat to the player, however other creatures, such as the Megapiranha, and drowning are things to look out for. Everything. They can't do anything and are killed easily, lower level Coel can be simply one shot with a throw of a spear or just kill it with your hands. The only weakness it is considered to have is it's instinct to swim away quickly. Coelacanth can be 'tamed' using Fish Basket . While they can level, they do not eat from the trough. Just put food (meat or fish) in their inventory and force feed, if necessary. In real life, Coelacanth's meat is actually bad for humans, as it contains oil, wax, urea, and other compounds that are hard to be digested. This could cause diarrhea. This is pointed out in the dossier, which states meat of Coelacanth nutritia contains less oil and urea than those of other Coelocanth species making it more suitable for eating. Coelacanth, was believed to be extinct 65 million years ago, until it was discovered again, alive, in 1938. 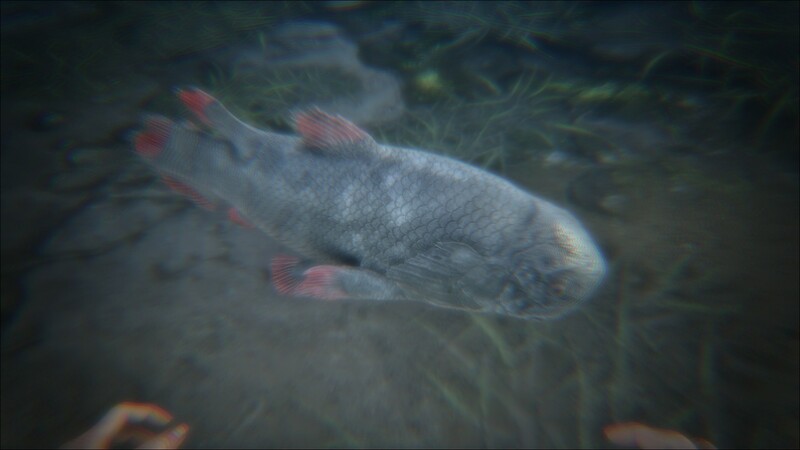 As of patch v180.0, when you kill a Coelacanth or Piranha with a spear, the fish is instantly grabbed so that you can stay out of the water. Depending on how much melee damage % you skilled on yourself or your Dino, gives you more Raw Fish Meat out of Coelacanths. Coelacanth are often a major cause of severe lag for most players due to the fact that they can spawn in enormous numbers in the rivers and lakes further inland. Thus, a way to reduce lag for many local games is to lower the Dino Count from 1.0 to about 0.5. 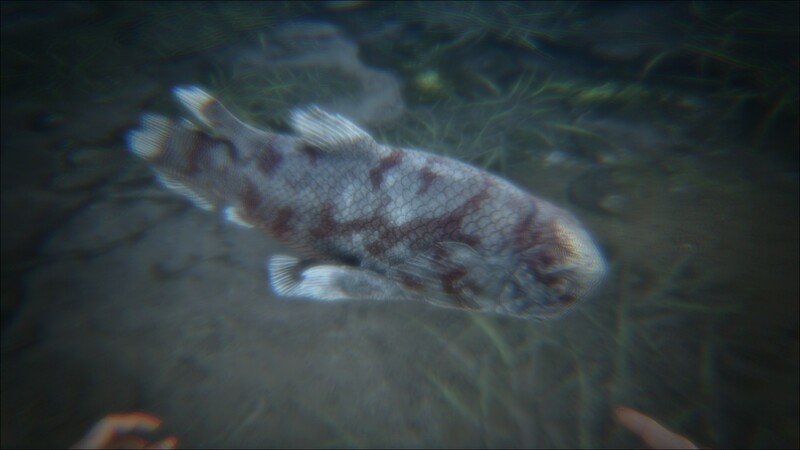 As of patch v235, Coelacanths come in different sizes, giving different amounts of meat depending on its size. Possible now to get over 200 meat from a single fish. As of patch v259, deep sea Coelacanths were added that are much bigger than ones found closer to the surface. This page was last edited on 15 April 2019, at 23:27.